Once the ancestral home of the Hayes family and now in private ownership. It was built in 1769 by William Hayes on a site with commanding views of Cork Harbour and is one of the finest examples of domestic Georgian architecture in Ireland. A three-storey building and a basement, with two almost identical facades of grey ashlar, the house has been a landmark in Crosshaven for over 200 years. Stories of its importance in the town's history are recalled for such deeds as the setting up of a Soup Kitchen during the famine years. Crosshaven House. After being restored to it’s former glory, it is now available for private hire, including accommodation, weddings and functions. Seasonal public tours also available. Holy Trinity Church - in gracefully proportioned limestone, the structure was built to the design of William Burges, who was also the architect of St Finn Barre's Cathedral in Cork, and shows fine examples of stained glass windows. Its foundation stone was laid on the 31st. October 1866. The adjoining schoolhouse, Templebreedy National School, was built in 1881. This is the local Catholic Church. The foundation stone was laid in 1869. It is named after the patron saint of Crosshaven as was the original Teampall Bride. This gothic style church was designed by Edward Welby Pugin and is constructed of Little Island limestone. 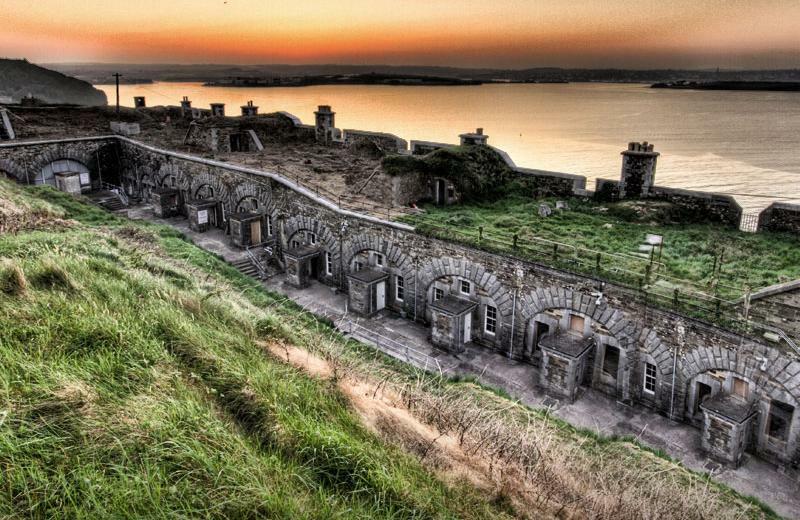 Fort Meagher (formally known as Fort camden) is recognised internationally to be one of the world's finest examples of a Classical Coast Artillery Fort. Fortifications at the site date from about 1550. They were further added-to in 1600. However, after the Battle of Kinsale the Fort became derelict. At the end of the 17th. century the Fort was fortified by the Jacobites in an effort to block the Williamites' naval forces. In 1690 it fired on the Williamite fleet as it entered Cork Harbour, but was silenced by a party sent ashore to attack it. It was known as James' Battery and consisted of two blockhouses and eight guns. During the war against the French in the late 1780's Crosshaven got a permanent garrison and the threat of war with Spain around 1790 led to the erection of new gun batteries on the site. The founders of this convent were a couple called the Liebers and two nuns, Mother M Teresa Tynan and Mother M Ignatius. The Liebers love story is an integral part of the history of this convent. It appears that Teresa Lieber was an Irish emigrant from Cork who was a stewardess on a steam liner on which Emil Lieber was travelling. He was a wealthy New York Jewish merchant and he fell in love with Teresa but because she was a catholic. She refused to marry him even though she did love him. He was fascinated with this religion that was standing in the way of them marrying. After much effort he eventually converted and they were married. They returned to Cork and funded the building of the convent. The convent chapel, which was built in 1883, is a typical gothic style building. The ruin that is now standing on this site is that of St Mathew's church which was built in 1779 and was used for about 100 years. The walls of the old Teampall Bride were standing until 1779 but were demolished when the new church was built. The oldest headstones in the graveyard lie to the north of the ruined church and about 40 of them date back to the 18th century. The oldest of them seems to be from 1711. There are two holy wells in Crosshaven. They are located at the edge of the Cruachan woods in the fields behind Crosshaven House. They are named after St Mary, better known as Our Lady’s well, and St. Brigid. St. Brigid's well having an obvious connection with Templebreedy or Brigid's Temple as the true translation from Irish would read. The Royal Cork Yacht Club, founded in 1720 and located at the village entrance, the oldest yacht club in the world, boasts a large sailing membership and a fleet ranging from the smallest sailing dinghies to fine ocean racing and cruising yachts. Among the local, national and international fixtures hosted by the club is Ireland’s premier yachting event ‘ Cork Week’ - a biennial gala of international sailing competition and festivities. The Hugh Coveney pier, departure and docking point for harbour tours, is HQ to the local R.N.L.I. lifeboat and also the Home of Crosshaven Sea bAngler's Club. Enjoying the reputation of being one of the country’s leading deep sea fishing centres, anglers from all over the world visit Crosshaven to experience that pleasure’s of Ireland’s rich fishing grounds.